A reliable source for ESD Table information and a resource for accessing leading ESD Table and suppliers. ESD Tables are ideal in situation where you limit and control the amount of electrostatic electricity in a particular area. ESD stands for electrostatic discharge and is the result of static buildup between two objects. Typically, electrostatic charge build-up occurs when two different types of materials rub together. One object will become positively charge while the other is negatively charged which will then inevitably lead to an ESD event if the object is not properly grounded. ESD Table ESD Tables are ideal in situation where you limit and control the amount of electrostatic electricity in a particular area. ESD stands for electrostatic discharge and is the result of static buildup between two objects. Typically, electrostatic charge build-up occurs when two different types of materials rub together. Normally an ESD surface will have a high resistance typically between 1.0 x 109 and 1.0 x 106 ohms. This will not only prevent rapid discharge of electrostatic which could harm electronic devices but also will protect the user from being harmed. Generally, in industrial testing applications the device may use a very high voltage which can be incredibly dangerous if an ESD event were to happen. 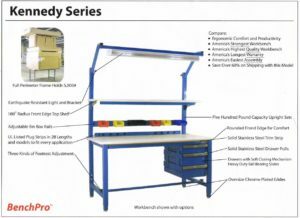 Computer Workbenches – BenchPro, Inc. While workbenches are popular in a variety of industries, computer workbenches provide several features specific to electronic and processing equipment. Common features include display mounts, ergonomic keyboard trays, CPU holders, cable and cord management devices, power distributors, rack mounts, arm mounts, ESD protection, document trays, drawers and cabinets all designed to improve organization and productivity while creating optimal storage conditions for computer components.